You have to hand it to Case IH, they may not be the most favourite of all manufacturers, but they are well known on the toy circuit thanks to a huge collection of Case IH farm toys. Thanks to toy makers need to expand their toy tractor range across all major agriculture manufacturers, we get to enjoy Case IH in all their glory, but in a toy version. 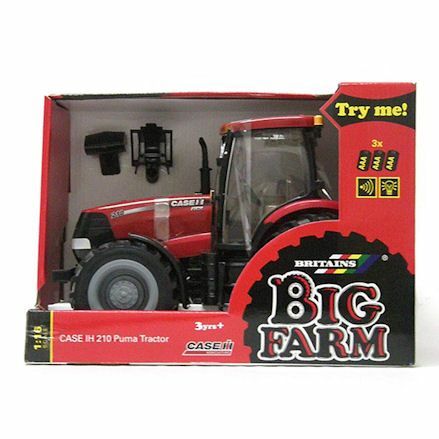 You might say Case IH toys may not be the first choice on kids shopping list, this is due to the more recognisable brands, but Case farm toys are still just as impressive. 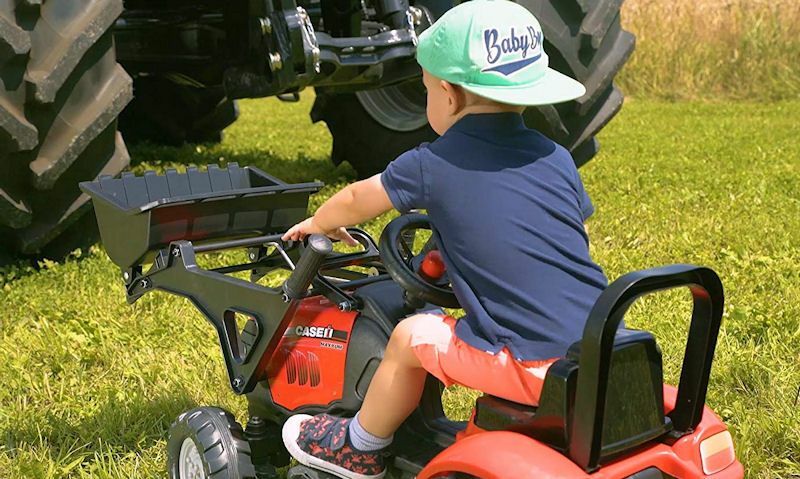 Best known for their bright red finish with black trim, Case IH toy tractors are produced on their real life counter-parts, so you'll find farm vehicles in all scale sizes. 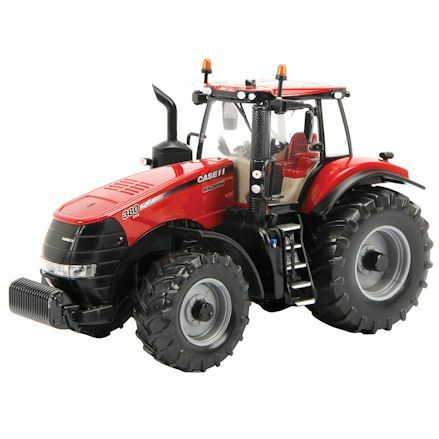 There's also toy farm implements and machinery to work with the these tractors, with radio control tractors and most importantly - Case IH merchandise for enthusiasts. We present to you a remarkable collection of die-cast Case IH toy tractors baring the Case IH crest and features. Among the best replica model toy tractors currently available must be the Britains Case IH selection, down sized to a 1:32 scale, made compatible with Britains implements. 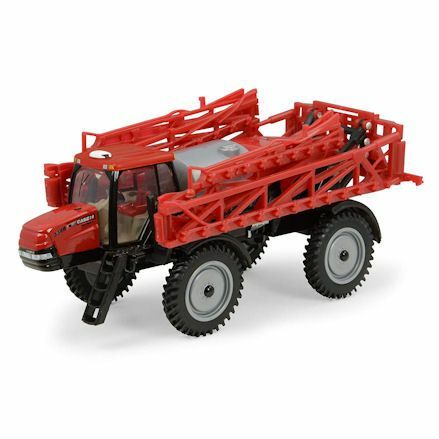 Case IH toys are not just limited to Britains farm toys, major toy makers including Siku re-produce nice replica models. Plus brands who produce scale models for collectors only, so they don't qualify as toys. Whether you're looking for die-cast scale models or toys, be sure to look out for Britains Case IH first thing for the widest selection currently available. Moving away from the small to medium size tractors, let's not forget there's a helping hand of nice big 1:16th scale toy tractors available to buy also. Bringing these options are Britains in their Big Farm series and Bruder (who we personally prefer) steering tractors. You might find a standalone tractor more widely available, but in Bruder you might get a tractor trailer set. The trailer might not be Case, but it should be a matching red. We've also notice a Bruder Case IH forestry tractor, equipped with support cage and cutting equipment. 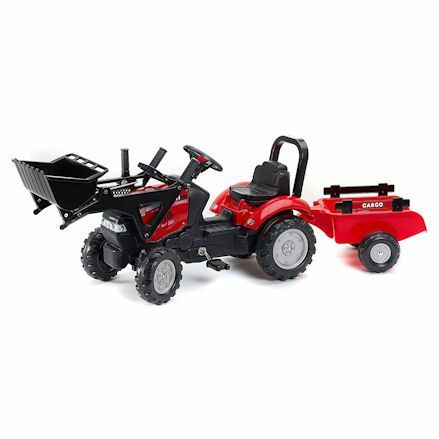 Where there's Case IH toy tractors there will be matching red Case toy farm machinery and implements. Though Case IH don't have a huge number of machines to go with the tractors, the small number available will fit just nicely with Britains farm toys. Currently, Britains are the largest producer, both past and present, of Case IH farm toy machinery made in die-cast and plastic. Up second you have Siku toys including a number of farm toys in 1:32 and 1:87 scale in their Farmer Series. You also have miniature Case model tractor machinery in Siku Super Series. Now we can't forget the availability of ride on tractors now can we. The range may not be as extensive as say, John Deere, but the available ride on tractors for sale baring the Case brands does give you a few options. In that respect, we've found the range to be quite interesting. As you would expect, there a few ride on pedal tractors to start, and a good full back if nothing else is found. Then, remarkably there's a go-kart and incredibly; a ride on site and scoot motorcycle and a pedal quad bike - all developed under the official Case IH name. Case farm toys are limited, but do provide a nice number of ride-on toys that us sure to excite the most eager fan. 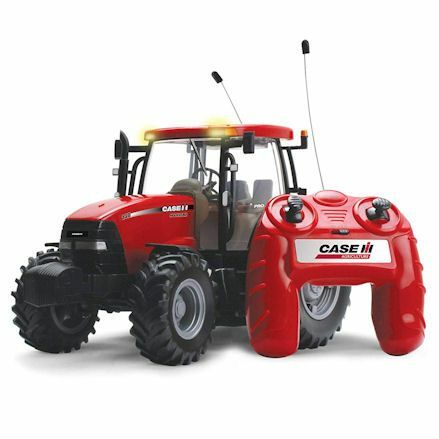 Enjoy Case IH toys in a very exciting radio control tractor version, complete with remote control and batteries. This radio control tractor does all the things regular R/C cars can do, with manoeuvres mimicking the real life machines. Britains R/C Case IH toy tractor comes in a 1:16 scale and will fit all the farm implements and trailers in the Britains Big Farm range. In the box you'll expect to find the tractor, remote control and a set of batteries to get you going straight out of the box. It has a long range to so take it out of the garden and test its compatibility across rough-terrain like mud and sand. 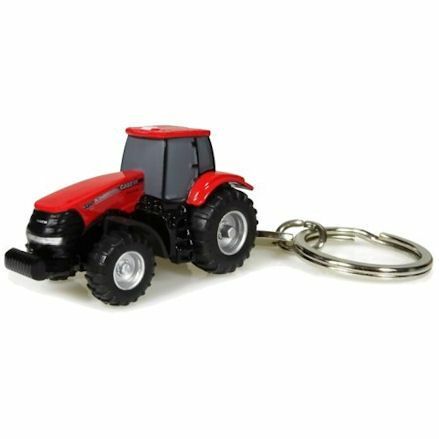 There's not much in the way of Case IH gifts for children at this time but there is tractor keyrings that also acts as a die-cast toy tractor once you remove the keyring. Likewise, you find combine harvester keyrings and the occasional farm implement. Simply throw in your Case IH keyring with your farms and you'll never know it was a key ring to start with. For Case IH fanatics or just fans of this fine machine you also have the option of officially licensed merchandise in the shape of mugs, clothing and footwear. There's also books, furnishings, decor and even pet accessories in with the red Case IH theme. We don't currently bring you these products but with a little search you'll sure find Case IH products for collectors and tractor enthusiasts alike.